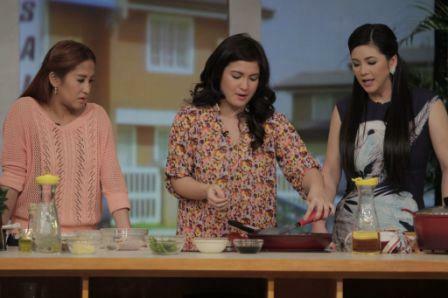 Camille Prats and Jolina Magdangal Cook in Sarap Diva this Saturday! For all the avid fans of the Asia’s Songbird, consider Saturday as your lucky day as Regine Velasquez-Alcasid opens her doors for her very first “Ga-Reg Sale”! Regine will give out some of her prized possessions, and the proceeds will go to Kapuso Foundation. Apart from this fun Ga-Reg Sale, Regine will also exchange the yummiest recipes with her guests Camille Prats and Jolina Magdangal! Watch out for Jolina’s On-The-Go Grilled Pork Ribs and Camille’s Breaded Chicken with Mocha Sauce! And of course, Regine will show off her fruity energy drink which is well-suited for her teen kapitbahays, the boyband turned Youtube sensation, Chicser! Jolina will also share the juicy details of her honeymoon with hubby Mark Escueta, and Camille will open up about how she gets through life as a single mom and who she’s dating at the moment!